The Architecture Student’s Handbook of Professional Practice opens the door to the vast body of knowledge required to effectively manage architectural projects and practice. A professional architect is responsible for much more than design; this book is specifically designed to help prepare you for the business and administrative challenges of working in the real-world—whether you are a student or are just starting out in practice. It provides clear insight into the legal, financial, marketing, management, and administrative tasks and issues that are integral to keeping a firm running. This new edition has been restructured to be a companion textbook for students undertaking architectural practice classes, while also fulfilling the specific knowledge needs of interns and emerging professionals. It supplements information from the professional handbook with new content aimed at those setting out in the architectural profession and starting to navigate their careers. New topics covered in this new edition include: path to licensure, firm identity, professional development, strategic planning, and integrated project delivery. Whether you want to work at a top firm, strike out on your own, or start the next up-and-coming team, the business of architecture is a critical factor in your success. This book brings the fundamentals together to give you a one-stop resource for learning the reality of architectural practice. Few architects were drawn to the profession by dreams of writing agreements and negotiating contracts, but those who excel at these everyday essential tasks impact their practice in innumerable ways. 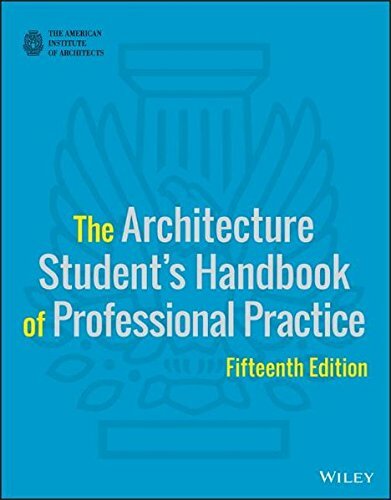 The Architecture Student’s Handbook of Professional Practice provides access to the “nuts and bolts” that keep a firm alive, stable, and financially sound.